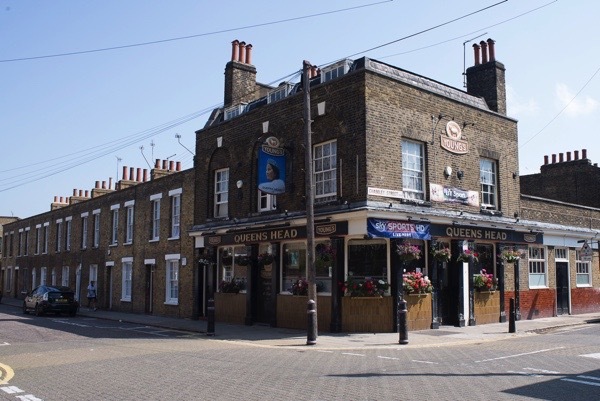 Save The Queen’s Head In Limehouse! These are dark days for East End pubs. 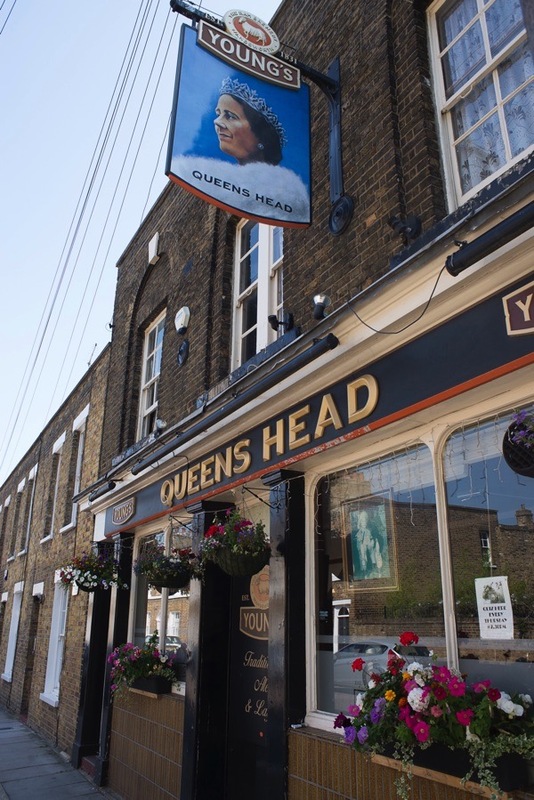 After the closure of The Widow’s Son in Bow for redevelopment last year, the Good Friday tradition of the Widow’s Buns was transferred to The Queen’s Head in York Sq, Limehouse, which is also under threat of closure. Yet, in spite of this, large crowds gathered at The Queen’s Head on Friday to celebrate in the Easter sunshine, undaunted by the grim climate for our beloved pubs. Erica, ex-landlady of The Widow’s Son, assured me that she has the historic buns in safe keeping until a permanent home for them is discovered. Meanwhile, a representative of HMS President came on behalf of the Royal Navy to place this year’s bun in a makeshift net at the corner of the bar at The Queen’s Head. 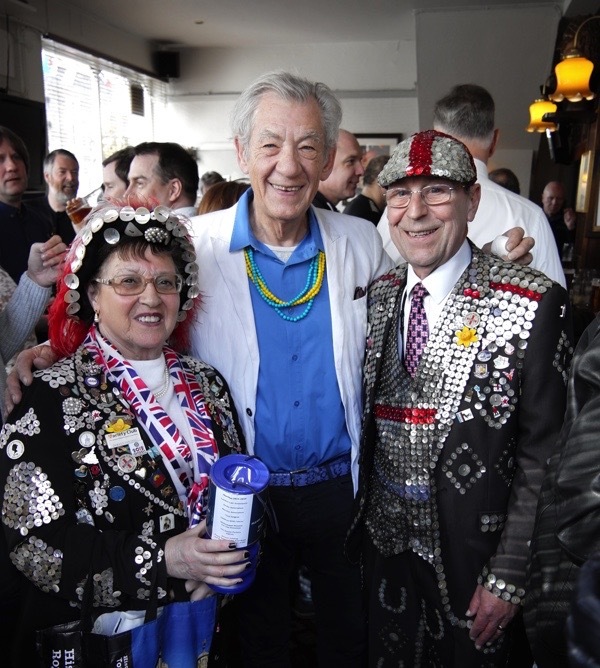 Ian McKellen dropped in to perform ‘The Ballad of the Widow’s Son’ and there was widespread jubilation as hot cross buns were distributed to all, courtesy of Mr Bunn the Baker in Chadwell Heath who, traditionally, always bakes the buns for the ceremony. 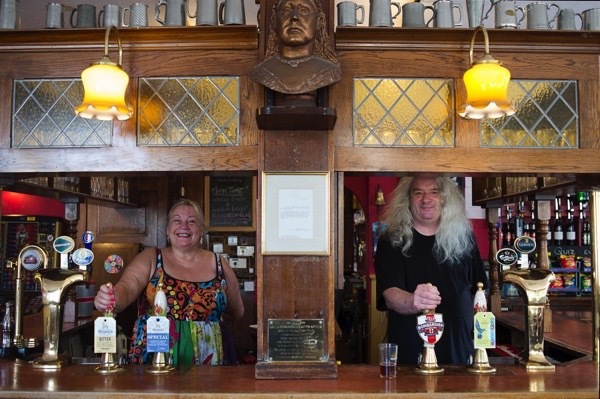 Jack Hunter & Denise West, landlords of The Queen’s Head, are determined that they will never call last orders in York Sq, and have launched a campaign to save the pub and ensure its survival in perpetuity. Since Tower Hamlets Council sold the Grade II listed building in 2012, its future has been uncertain but, in January, it was declared an Asset of Community Value, offering the chance for local people to take control of their pub. 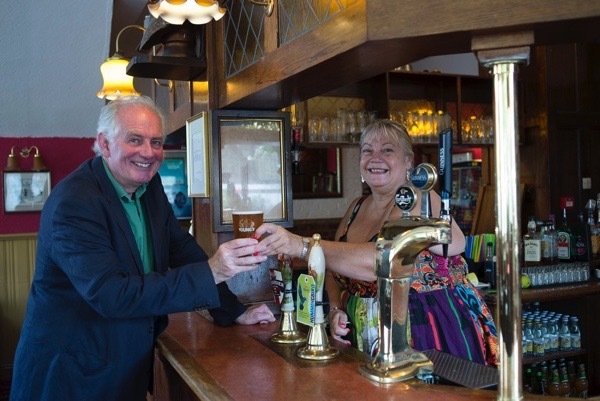 Jack & Denise have launched a campaign for community purchase of the pub by establishing a Trust and they need your support in pledging to buy shares. Already, in just four days, over £44,000 has been raised. Now they have until August 29th to raise £525,000 to buy a hundred and twenty year lease on the pub. 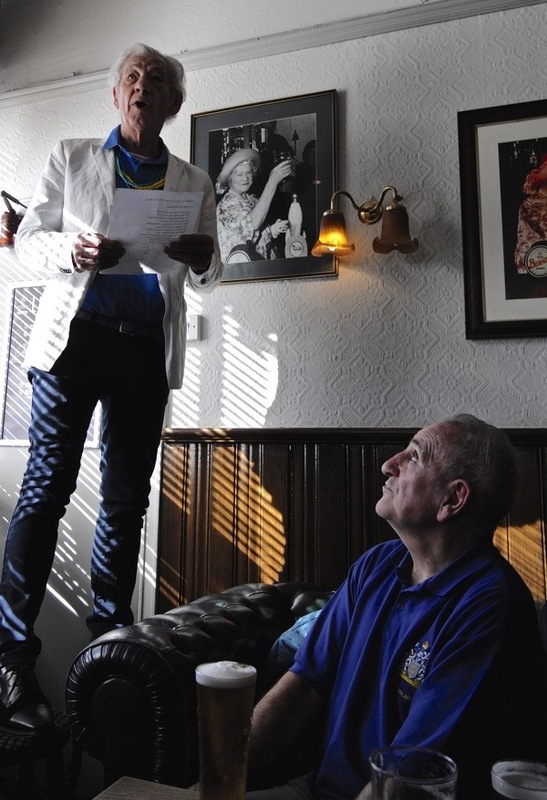 ‘If we don’t take this opportunity,’ Jack admitted to me, ‘it will be shut.’ If the bid for community ownership fails and the money is not raised, the pub will go to public auction and likely face redevelopment. Commercial Rd was created in 1802 to bring traffic from West India Docks and East India Docks, and York Sq was laid out shortly afterwards, around 1825, by George Smith. It seems likely that The Queen’s Head was part of this design and the building dates from this era, with Simon Williams as the first recorded landlord in 1839. Although the Queen originally commemorated was likely to have been George III’s wife Queen Caroline, the pub had a long association with Elizabeth, the Queen Mother. The Bowes-Lyon family owned land nearby in Stepney and legend has it that she first visited during the blitz as the consort of George VI, while photos in the bar witness her return in 1987 to pull a pint. Please help save this historic pub at the corner of one of the East End’s most beautiful squares for generations to come. This is a marvellous pub in a beautiful square. The Council should never have sold it in the first place. Good luck with the campaign! 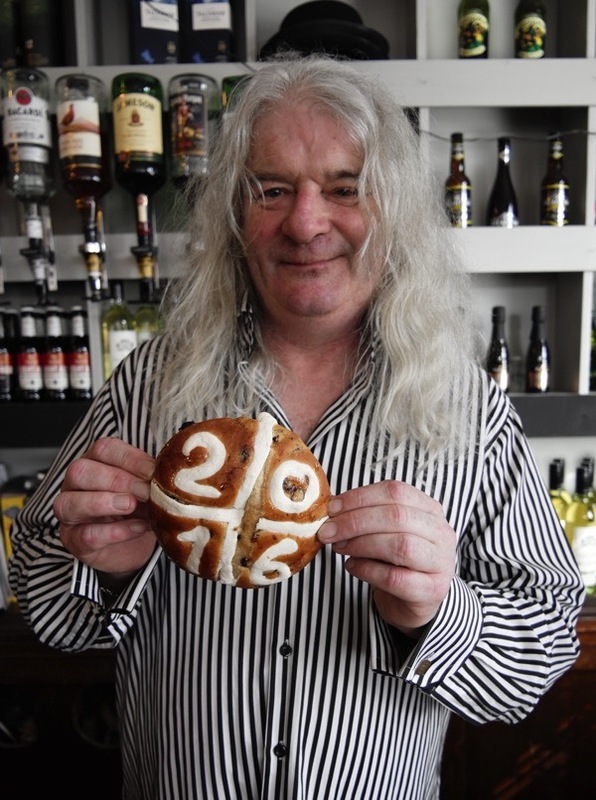 I’m glad to see the tradition of the Window’s Son’s hot cross buns is being safely kept alive with the help of the Queen’s Head. I love to see your annual blog about the ceremony and was wondering how it would play out this year. Happy Easter from across the pond. Hope that the campaign succeeds. Would be sad if not! York Sq was, legend has it, the inspiration for Albert Sq in EastEnders, which makes the Queen’s Head the original Queen Vic. The pub also has (or used to, last time I went in) a rare London dartboard. Thanks very much to the Gentle Author for bringing our campaign and the story of the Bun-In to the attention of others in the Spitalfields Life reading community. 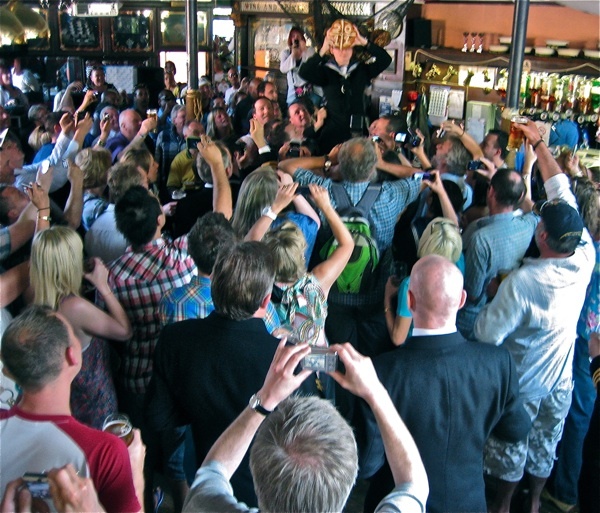 The Queens Head is a special place, a real “community centre” in the truest sense of the word. It would be a travesty if it were allowed to close and we as a community have a responsibility to future generations to keep it going strong. Please support us – support can be for the campaign itself or just by popping in and saying hello! 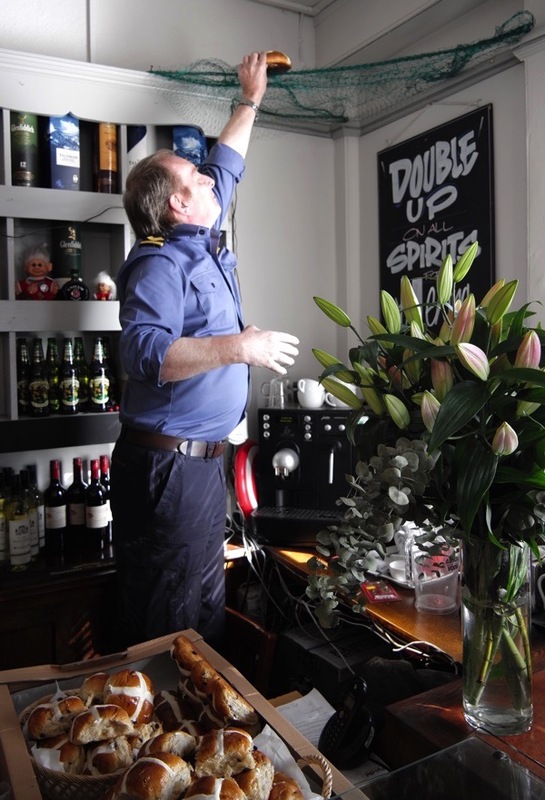 You can be guaranteed a warm welcome, a decent pint and yes…a game of darts if you’re so inclined!